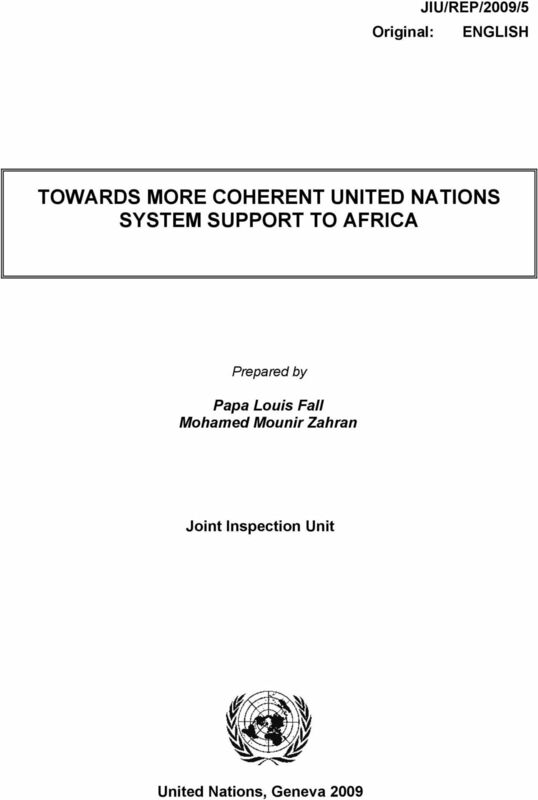 Download "TOWARDS MORE COHERENT UNITED NATIONS SYSTEM SUPPORT TO AFRICA"
6 iv the planning, programming and budget cycles of the programmes of the United Nations system organizations in support of the AU and its NEPAD programme (see Recommendation 6), and the assignment of focal points in the participating organizations of the RCM for improving interaction, communication and information sharing (see Recommendation 7); Fully implementing and operationalizing the Umbrella Agreement between the regional commissions and the United Nations Development Programme (UNDP) in order to facilitate and enhance communication, coordination and cooperation between ECA and the RCM on one side and UNDP and the Regional Directors Teams (RDTs) in Africa on the other (see Recommendation 8); Participation of all United Nations system organizations in the RCM in order to further leverage the technical expertise of the mechanism and to create further synergies within the United Nations system in support of the AU and its NEPAD programme (see Recommendation 9); Enhancing coherence at the subregional level by leveraging the capacities of ECA and its five subregional offices in Africa; establishing a system-wide subregional coordination mechanism; and ensuring that the Regional Economic Communities (RECs) in Africa are closely involved in the work of the RCM (see Recommendation 10) and that all United Nations system organizations are, as appropriate, accredited to the RECs (see Recommendation 11). As the main beneficiary parties, the African recipient Governments should be more closely and consistently involved in the development, implementation and monitoring of the United Nations Development Assistance Frameworks (UNDAFs) in order to promote national ownership and leadership, as well as to take on board the specific needs and priorities of the beneficiary countries (see Recommendation 12). 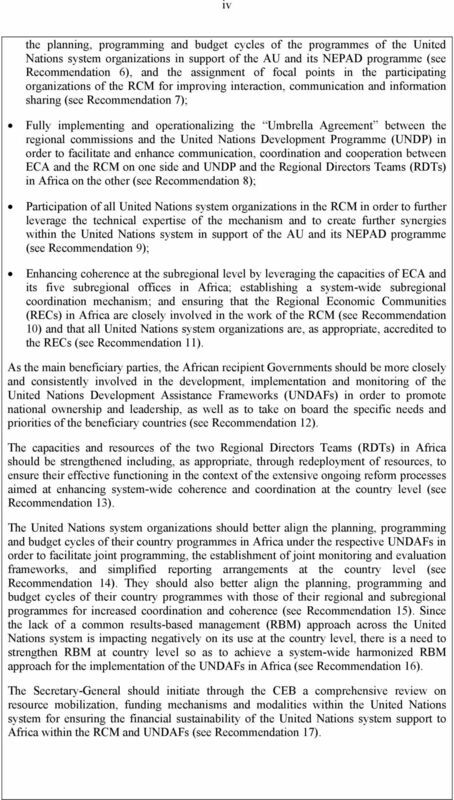 The capacities and resources of the two Regional Directors Teams (RDTs) in Africa should be strengthened including, as appropriate, through redeployment of resources, to ensure their effective functioning in the context of the extensive ongoing reform processes aimed at enhancing system-wide coherence and coordination at the country level (see Recommendation 13). The United Nations system organizations should better align the planning, programming and budget cycles of their country programmes in Africa under the respective UNDAFs in order to facilitate joint programming, the establishment of joint monitoring and evaluation frameworks, and simplified reporting arrangements at the country level (see Recommendation 14). They should also better align the planning, programming and budget cycles of their country programmes with those of their regional and subregional programmes for increased coordination and coherence (see Recommendation 15). 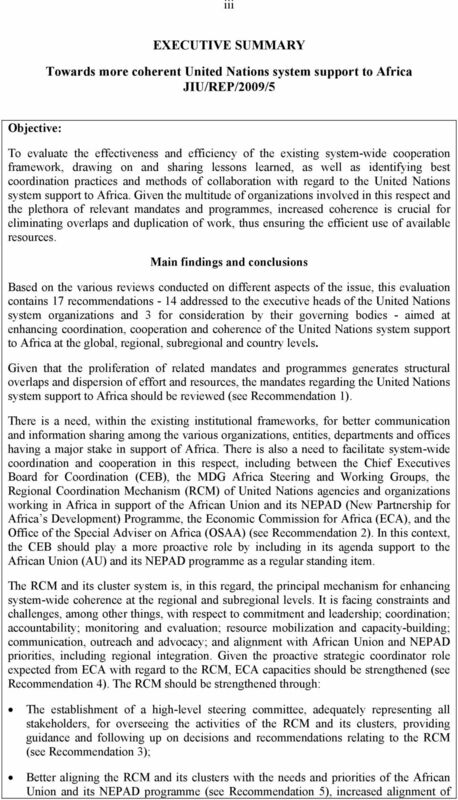 Since the lack of a common results-based management (RBM) approach across the United Nations system is impacting negatively on its use at the country level, there is a need to strengthen RBM at country level so as to achieve a system-wide harmonized RBM approach for the implementation of the UNDAFs in Africa (see Recommendation 16). The Secretary-General should initiate through the CEB a comprehensive review on resource mobilization, funding mechanisms and modalities within the United Nations system for ensuring the financial sustainability of the United Nations system support to Africa within the RCM and UNDAFs (see Recommendation 17). 7 v Recommendation 1 Recommendations for consideration by legislative organs The General Assembly and the legislative bodies of the corresponding United Nations system organizations should invite the Secretary-General and the executive heads of the other United Nations system organizations to undertake a review of their respective mandates pertaining to United Nations system support to Africa, in order to assess the status of implementation, to evaluate resource, monitoring and reporting requirements for implementation and to better clarify the division of labour and responsibilities within the United Nations system and between the different organs, offices and departments of every United Nations system organization. Recommendation 4 The General Assembly should reiterate its support for strengthening the capacities of the Economic Commission for Africa (ECA) and invite the Secretary-General to take further measures by allocating adequate resources to ECA including, as appropriate, through redeployment of resources, to enable it to effectively fulfil its strategic coordinating role with regard to the RCM in support of the AU and its NEPAD programme. Recommendation 16 The General Assembly and the legislative bodies of the corresponding United Nations system organizations should reaffirm their commitment to resultsbased management (RBM) and request the executive heads of the United Nations system organizations to harmonize their RBM practices for achieving a common RBM approach at country level with regard to the implementation of the UNDAFs in Africa. 11 1 I. INTRODUCTION A. Objective and focus 1. As part of its programme of work for 2008, the Joint Inspection Unit (JIU) conducted, at the suggestion of the United Nations Industrial Development Organization (UNIDO), an evaluation entitled Towards more coherent United Nations system support to Africa. 2. The evaluation is aimed at assessing the effectiveness and efficiency of the existing system-wide cooperation framework, drawing on and sharing lessons learned as well as identifying best coordination practices and methods of collaboration with regard to the United Nations system support to Africa, based on the various reviews undertaken so far on different aspects of the issue by the Secretary-General, the United Nations System Chief Executives Board for Coordination (CEB), the JIU, the Office of Internal Oversight Services (OIOS), the Office of the Special Adviser on Africa (OSAA), the Economic Commission for Africa (ECA) and other members of the United Nations system. This evaluation focuses on development issues, in particular those outlined in Goal 8 of the Millennium Development Goals (MDGs) Develop a global partnership for development. 3. The evaluation assesses how coherently the beneficiary Governments, the United Nations system organizations and the donor community are working together at the global, regional, subregional and country levels through existing coordination mechanisms. In doing so, the evaluation examines, inter alia, the functioning, effectiveness and efficiency of the existing system-wide coordination mechanisms, in particular the Regional Coordination Mechanisms (RCM) 1 of United Nations agencies and organizations working in Africa in support of the African Union (AU) and its NEPAD (New Partnership for Africa s Development) Programme, and issues pertaining to the Resident Coordinator system. 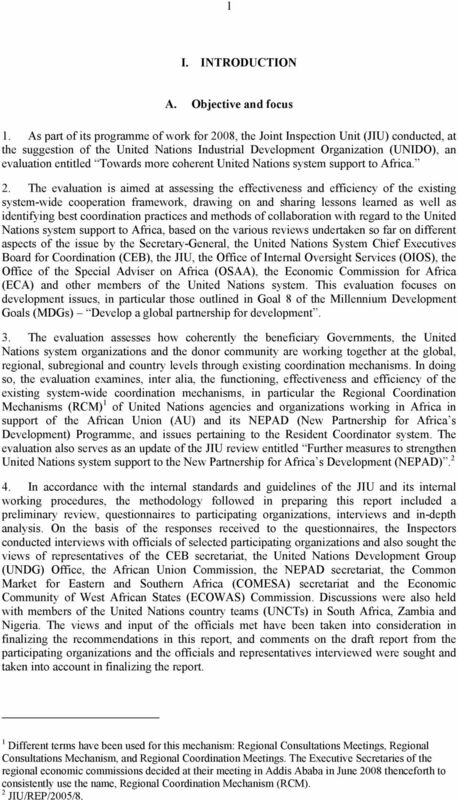 The evaluation also serves as an update of the JIU review entitled Further measures to strengthen United Nations system support to the New Partnership for Africa s Development (NEPAD) In accordance with the internal standards and guidelines of the JIU and its internal working procedures, the methodology followed in preparing this report included a preliminary review, questionnaires to participating organizations, interviews and in-depth analysis. On the basis of the responses received to the questionnaires, the Inspectors conducted interviews with officials of selected participating organizations and also sought the views of representatives of the CEB secretariat, the United Nations Development Group (UNDG) Office, the African Union Commission, the NEPAD secretariat, the Common Market for Eastern and Southern Africa (COMESA) secretariat and the Economic Community of West African States (ECOWAS) Commission. Discussions were also held with members of the United Nations country teams (UNCTs) in South Africa, Zambia and Nigeria. The views and input of the officials met have been taken into consideration in finalizing the recommendations in this report, and comments on the draft report from the participating organizations and the officials and representatives interviewed were sought and taken into account in finalizing the report. 1 Different terms have been used for this mechanism: Regional Consultations Meetings, Regional Consultations Mechanism, and Regional Coordination Meetings. The Executive Secretaries of the regional economic commissions decided at their meeting in Addis Ababa in June 2008 thenceforth to consistently use the name, Regional Coordination Mechanism (RCM). 2 JIU/REP/2005/8. 12 2 5. In accordance with article 11.2 of the JIU statute, this report has been finalized after consultation among the Inspectors so as to test its conclusions and recommendations against the collective wisdom of the Unit. 6. To facilitate the handling of the report and the implementation of its recommendations and the monitoring thereof, annex VI contains a table indicating whether the report is submitted to the organizations concerned for action or for information. The table identifies those recommendations relevant for each organization, specifying whether they require a decision by the legislative or governing body of the organization, or can be acted upon by its executive head. 7. The Inspectors wish to express their appreciation to all who assisted them in the preparation of this report, and particularly to those who participated in the interviews and so willingly shared their knowledge and expertise. B. Background 8. Africa has been for a long time a focus of United Nations system technical cooperation and development activities. Following the United Nations Programme of Action for African Economic Recovery and Development (UNPAAERD) launched in as the first ever United Nations programme for a specific region in the world - and the United Nations New Agenda for the Development of Africa in the 1990s (UN-NADAF), NEPAD has become, since its adoption in 2001 by the AU, the principal strategic framework within which the United Nations system is concentrating its efforts for Africa s development. 3 According to General Assembly resolution 63/1, NEPAD is an overarching framework for socio-economic sustainable development in Africa, as well as for the implementation of national and subregional development plans and strategies. 4 It is complemented by the Ten-year Capacity- Building Programme for the African Union, signed in 2006, between the AU and the United Nations highlighting the key areas for cooperation between the two organizations. 5 Further, the United Nations Millennium Declaration, 6 the Monterrey Consensus of the International Conference on Financing for Development, 7 the Plan of Implementation of the World Summit on Sustainable Development ( Johannesburg Plan of Implementation ), 8 the 2005 World Summit Outcome 9 and the Programme of Action for the Least Developed Countries (LDCs) for the Decade , 10 among others, provide guidance and a framework for United Nations system support to Africa. 9. 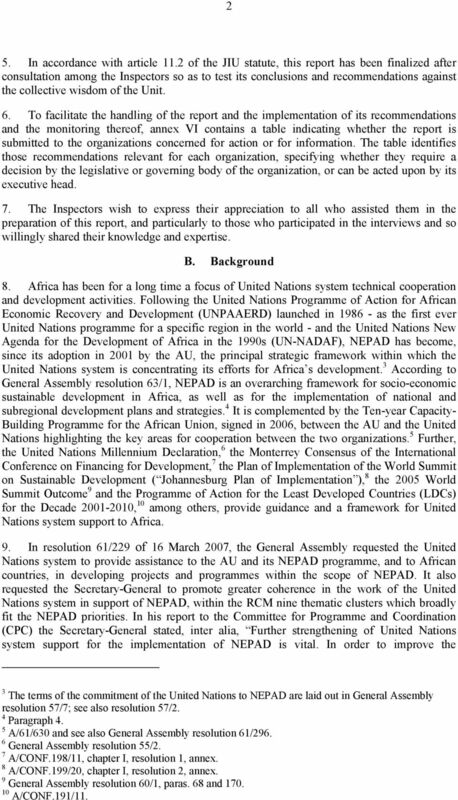 In resolution 61/229 of 16 March 2007, the General Assembly requested the United Nations system to provide assistance to the AU and its NEPAD programme, and to African countries, in developing projects and programmes within the scope of NEPAD. It also requested the Secretary-General to promote greater coherence in the work of the United Nations system in support of NEPAD, within the RCM nine thematic clusters which broadly fit the NEPAD priorities. In his report to the Committee for Programme and Coordination (CPC) the Secretary-General stated, inter alia, Further strengthening of United Nations system support for the implementation of NEPAD is vital. 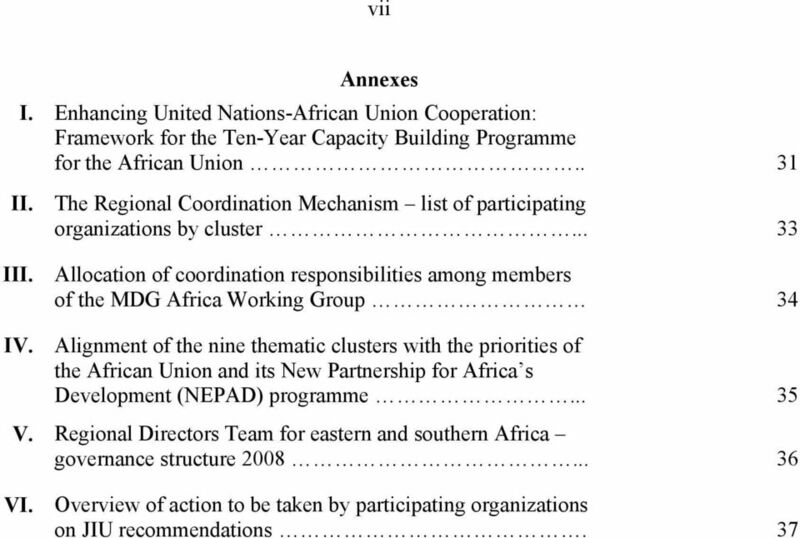 In order to improve the 3 The terms of the commitment of the United Nations to NEPAD are laid out in General Assembly resolution 57/7; see also resolution 57/2. 4 Paragraph 4. 5 A/61/630 and see also General Assembly resolution 61/ General Assembly resolution 55/2. 7 A/CONF.198/11, chapter I, resolution 1, annex. 8 A/CONF.199/20, chapter I, resolution 2, annex. 9 General Assembly resolution 60/1, paras. 68 and A/CONF.191/11. 13 3 effectiveness of the coordination of United Nations support within the regional consultation mechanism, both policy measures and urgent actions are needed. In particular, the United Nations system could gain from the efficient and coherent collaboration of various agencies involved in developing integrated programmes and projects in agriculture, infrastructure, communication and environment However, the growing number of agencies operating in Africa and the multiplicity of coordinating, steering, working committees and groups, as well as interdepartmental task forces throughout the United Nations system which support Africa s development, are increasingly posing serious challenges to the ability of the United Nations to carry out its work in the African continent with enhanced coordination, efficiency, clarity and coherence, in order to obtain optimum results while, at the same time, safeguarding and promoting Africa s key objectives, national ownership and leadership. 11. Indeed, greater coherence of the United Nations system support to Africa is essential at all levels: global, regional, subregional and country levels. Although there is, in practice, no strict separation between the different levels and close linkages exist, this report is deliberately structured into three main parts examining coherence issues at the global (chapter II), regional and sub-regional (chapter III) and country (chapter IV) levels, in order to tackle a complex subject in a structured and reader-friendly manner. Interlinkages between the different levels are given due consideration and presented in each chapter within the pertinent context. II. ENHANCING COHERENCE AT THE GLOBAL LEVEL 12. OSAA, the CEB, including its three high-level committees (the High-level Committee on Management, the High-level Committee on Programmes and the United Nations Development Group), the MDG Africa Steering Group and the MDG Africa Working Group established in September 2007, are the principal bodies mandated to enhance system-wide coherence and coordination with regard to United Nations system support to Africa at the global level. 12 However, the Inspectors have identified shortcomings in achieving enhanced coordination and synergies between these entities. A. Office of the Special Adviser on Africa 13. 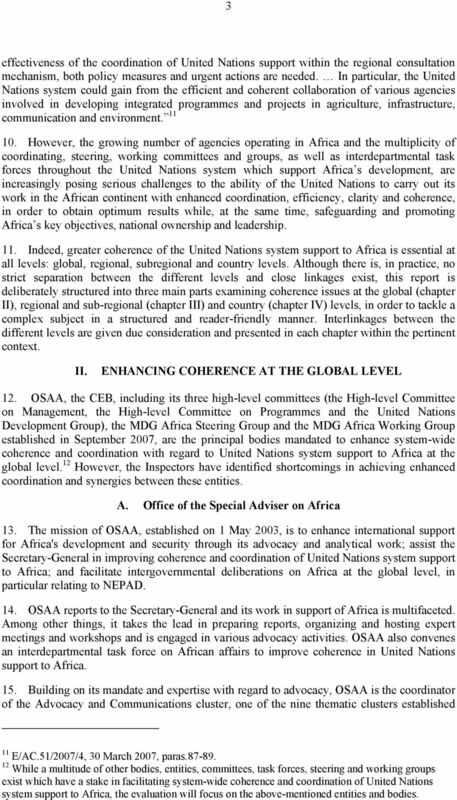 The mission of OSAA, established on 1 May 2003, is to enhance international support for Africa's development and security through its advocacy and analytical work; assist the Secretary-General in improving coherence and coordination of United Nations system support to Africa; and facilitate intergovernmental deliberations on Africa at the global level, in particular relating to NEPAD. 14. OSAA reports to the Secretary-General and its work in support of Africa is multifaceted. Among other things, it takes the lead in preparing reports, organizing and hosting expert meetings and workshops and is engaged in various advocacy activities. OSAA also convenes an interdepartmental task force on African affairs to improve coherence in United Nations support to Africa. 15. Building on its mandate and expertise with regard to advocacy, OSAA is the coordinator of the Advocacy and Communications cluster, one of the nine thematic clusters established 11 E/AC.51/2007/4, 30 March 2007, paras While a multitude of other bodies, entities, committees, task forces, steering and working groups exist which have a stake in facilitating system-wide coherence and coordination of United Nations system support to Africa, the evaluation will focus on the above-mentioned entities and bodies. 14 4 within the framework of the RCM aimed at coordinating United Nations system-wide support to NEPAD at the regional and subregional levels. Other members of the cluster include the Department of Public Information (DPI), ECA and the NEPAD secretariat. The main objectives are to promote greater understanding of NEPAD globally, build support for NEPAD among Africans and the international community, and promote the work of the United Nations in support of NEPAD. 16. While there is good cooperation between OSAA, ECA and DPI, the Inspectors realized that the division of labour and responsibilities between these entities is not always clear in practice. Although the work of OSAA in support of Africa is centred on the global level and that of ECA on the regional and subregional levels, a clear separation of responsibilities is, in practice, sometimes difficult to achieve, which may result in overlap and duplication of work. Further, the Inspectors believe that the flow of information between OSAA/DPI and ECA is essential and could be improved, considering that it is mutually beneficial for all: OSAA and DPI rely on the information provided by ECA and the RCM for their advocacy work, while ECA and the RCM benefit from the advocacy work of OSAA and DPI, which increases the visibility of and the support for ECA and the RCM. B. Chief Executives Board for Coordination 17. The CEB is the only system-wide coordination mechanism. It is composed of the executive heads of all United Nations system organizations and meets twice a year under the chairmanship of the Secretary-General. The CEB furthers coordination and coherence on a whole range of substantive and management issues. It is supported by three high-level committees: the High-level Committee on Programmes (HLCP) which is mandated to promote global policy coherence, the High-level Committee on Management (HLCM) which supports the harmonization of business practices across the system and United Nations Development Group (UNDG) which promotes coherent and effective oversight, as well as providing guidance and capacity-building with regard to operational aspects at the country level. 18. The CEB contributes significantly to enhancing the coherence of United Nations system support to Africa, including through its work on the recommendations of the High-level Panel on United Nations System-wide Coherence in the areas of development, humanitarian assistance and the environment, and the related report of the co-chairs, the harmonization of business practices, its work on specific issues, such as climate change and food crises. Further, with half of the eight pilot programmes under Delivering as one taking place in Africa (Cape Verde, Mozambique, Rwanda and Tanzania) and the high percentage of developing countries in Africa in comparison to other regions (two thirds of LDCs are in Africa), Africa also benefits greatly from the work of UNDG on the operational activities of the United Nations system for development at the country level. C. MDG Africa Steering Group 19. The MDG Africa Steering Group, established in September 2007 by the Secretary- General, brings together the leaders of multilateral development organizations with a view to identifying the practical steps needed to achieve the MDGs and other internationally agreed development goals in Africa. The Group is chaired by the Secretary-General and comprises the Chairperson of the African Union Commission, the President of the European Commission, the Secretary-General of the Organisation for Economic Co-operation and Development (OECD), the President of the African Development Bank (AfDB), the President of the Islamic Development Bank (IDB), the President of the World Bank and the Managing Director of the International Monetary Fund (IMF). 15 5 20. The objectives of the MDG Africa Steering Group are to strengthen international mechanisms for implementation in the five areas of health, education, agriculture and food security, infrastructure, and statistical systems; improve aid predictability; and enhance coordination at the country level. It is supported by the MDG Africa Working Group, composed of representatives of the United Nations system and other major multilateral organizations and chaired by the Deputy Secretary-General. The Working Group reaches out to African Governments, prepares action plans for achieving the objectives of the Steering Group, and mobilizes and coordinates the efforts of the institutions represented. 21. The MDG Africa Working Group has established seven technical thematic groups. 13 Five of them are expected to develop actionable business plans to support the implementation of the recommendations of the MDG Africa Steering Group. These five groups are coordinated by organizations which have been given the respective lead mandates. 14 D. Multiplicity of mandates and activities 22. The United Nations system encompasses no less than 13 specialized agencies and related organizations, 12 funds and programmes and other United Nations entities, 17 departments and offices of the Secretariat, five regional commissions, five research and training institutes and a plethora of regional and country-level structures. 15 While each entity has different governing bodies with varying membership, specific mandate and area of activities, it should be noted that overlap and duplication do exist between them. As stated by the High-level Panel on United Nations System-wide Coherence, in some sectors, such as water and energy, more than 20 United Nations agencies are active and compete for limited resources without a clear collaborative framework. More than 30 United Nations agencies and programmes have a stake in environmental management and sustainable development. On specific issues, such as internally displaced people, several agencies have a legitimate interest, but none has a clear lead The growing number of multilateral development organizations active in Africa and, in particular the proliferation of mandates, pose a challenge to coherent United Nations support to Africa. In the follow-up to the outcome of the Millennium Summit and as requested by the General Assembly, the Secretariat has set up an electronic mandate registry 17 which contains an inventory of mandates adopted by the United Nations General Assembly, the Security Council and the Economic and Social Council. 18 According to this registry, 1,266 active mandates relating to Africa had been adopted by the General Assembly, the Security Council and the Economic and Social Council as of 2006, of which 996 mandates by the General Assembly. 19 As this registry has not been updated, numerous additional mandates, directly or indirectly related to the United Nations support to Africa, have been adopted, including, for example, in General Assembly resolutions 61/229, 61/296 and 63/1. Furthermore, the governing bodies of other United Nations system organizations, specialized agencies, funds and programmes have also adopted their own additional mandates. 24. As noted in the report of the Secretary-General entitled Mandating and delivering: analysis and recommendations to facilitate the review of mandates, the current situation may 13 See annex III of the present report. 14 See 15 See A/61/583, annex V. 16 Ibid., para The registry of mandates, along with accompanying guidance for users, is accessible at 18 See A/60/733, paras See footnote 17 above. 16 6 result in burdensome reporting requirements; overlap between and within organs; an unwieldy and duplicative architecture for implementation; and a gap between mandates and resources During their meetings and discussions, the Inspectors noted that these concerns were also shared by many officials interviewed at headquarters and in the field. 21 While some agencies do undertake regular reviews of their support to Africa initiatives, for example the Governing Council of the United Nations Environment Programme (UNEP), many other organizations do not engage in similar exercises. 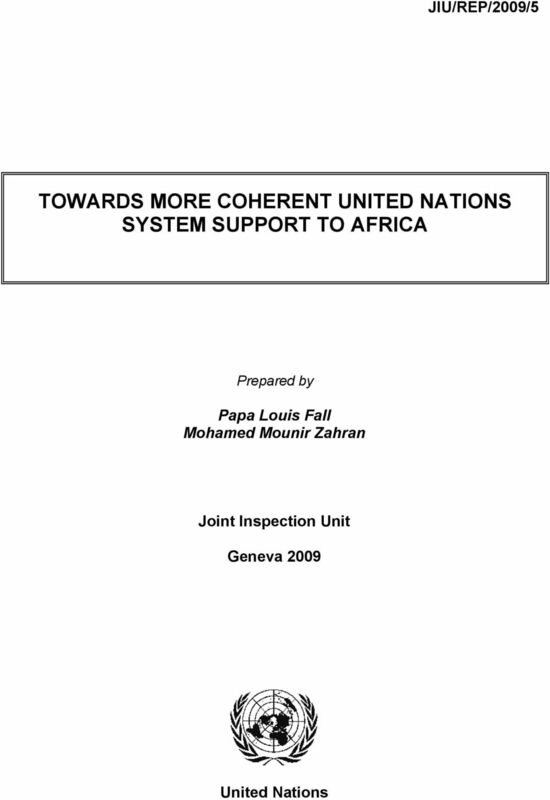 The Inspectors therefore propose that all mandates pertaining to the United Nations system support to Africa should be reviewed in order to assess their status of implementation and evaluate resource, monitoring and reporting requirements, to better clarify the division of labour and responsibilities within the United Nations system and between its different bodies, as well as to keep up with the current needs and priorities of the beneficiary countries. The suggestions and guidance provided in the above-mentioned report of the Secretary-General regarding a possible mandate review pertaining to programmes in support of Africa s development should be taken into account, as appropriate The implementation of the following recommendation is expected to enhance the coherence, effectiveness and efficiency of United Nations system support to Africa. Recommendation 1 The General Assembly and the legislative bodies of the corresponding United Nations system organizations should invite the Secretary-General and the executive heads of the other United Nations system organizations to undertake a review of their respective mandates pertaining to United Nations system support to Africa, in order to assess the status of implementation and evaluate resource, monitoring and reporting requirements, and to better clarify the division of labour and responsibilities within the United Nations system and between its different organs, offices and departments. E. Strengthening communication and sharing of information 27. Given the high number of United Nations system organizations and their complex bureaucracy, a number of inter-agency committees, steering groups, working groups and initiatives have been established with a view to enhancing United Nations system-wide coordination and coherence. Prominent among these bodies and groups with relevance for support to Africa are, as mentioned above, the CEB, the two MDG Africa Groups and the RCM. But a multitude of other inter-agency bodies and groups exist for facilitating coherent and coordinated support to Africa within the framework of the NEPAD programme, including, UN-Water, UN-Energy and the Joint United Nations Programme on HIV/AIDS (UNAIDS), 23 as well as other major initiatives such as in the areas of food security and rural development, 24 air transport safety, 25 information and telecommunication technology 26 and 20 See A/60/733, summary. 21 See E/AC.51/2009/2, paras and OIOS audits of OHRLLS and OSAA. 22 A/60/733, paras The High Level Committee on Programmes has prepared an inventory of inter-agency working groups, committees and mechanisms. 24 See the Comprehensive Africa Agriculture Development Programme (CAADP) and its Partnership Platform (CAADP PP). 17 7 shipping, which also serve as vehicles for United Nations coordination in their respective areas. 28. While interaction, communication and information sharing between the entities mandated to advance United Nations system coordination and coherence are, to some extent, taking place through different channels and means, in the view of the Inspectors it is far from being at an optimum level. For instance, information available at the RCM secretariat based at ECA on the work of the MDG Africa Steering and Working Group as well as the two Regional Directors Teams (RDTs) in Africa was rather limited, and vice versa. With regard to major initiatives related to African development which several agencies have developed, the situation is similar. 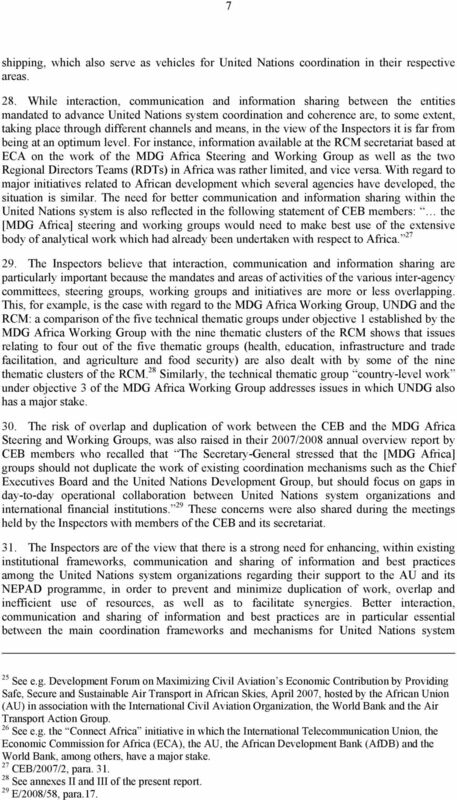 The need for better communication and information sharing within the United Nations system is also reflected in the following statement of CEB members: the [MDG Africa] steering and working groups would need to make best use of the extensive body of analytical work which had already been undertaken with respect to Africa The Inspectors believe that interaction, communication and information sharing are particularly important because the mandates and areas of activities of the various inter-agency committees, steering groups, working groups and initiatives are more or less overlapping. This, for example, is the case with regard to the MDG Africa Working Group, UNDG and the RCM: a comparison of the five technical thematic groups under objective 1 established by the MDG Africa Working Group with the nine thematic clusters of the RCM shows that issues relating to four out of the five thematic groups (health, education, infrastructure and trade facilitation, and agriculture and food security) are also dealt with by some of the nine thematic clusters of the RCM. 28 Similarly, the technical thematic group country-level work under objective 3 of the MDG Africa Working Group addresses issues in which UNDG also has a major stake. 30. 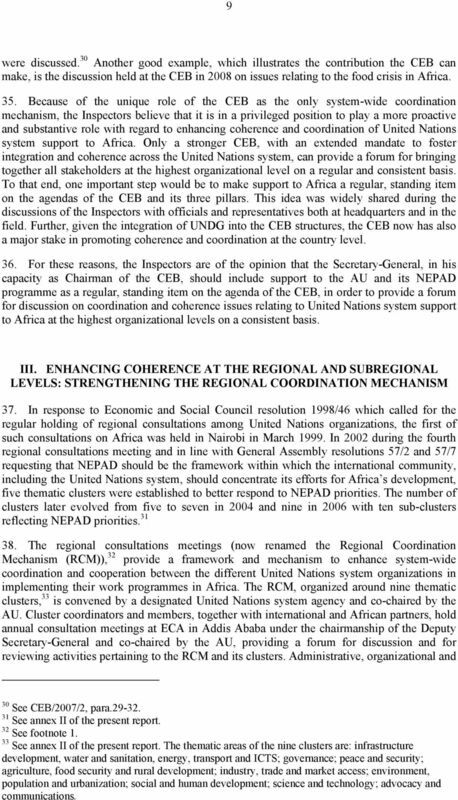 The risk of overlap and duplication of work between the CEB and the MDG Africa Steering and Working Groups, was also raised in their 2007/2008 annual overview report by CEB members who recalled that The Secretary-General stressed that the [MDG Africa] groups should not duplicate the work of existing coordination mechanisms such as the Chief Executives Board and the United Nations Development Group, but should focus on gaps in day-to-day operational collaboration between United Nations system organizations and international financial institutions. 29 These concerns were also shared during the meetings held by the Inspectors with members of the CEB and its secretariat. 31. The Inspectors are of the view that there is a strong need for enhancing, within existing institutional frameworks, communication and sharing of information and best practices among the United Nations system organizations regarding their support to the AU and its NEPAD programme, in order to prevent and minimize duplication of work, overlap and inefficient use of resources, as well as to facilitate synergies. Better interaction, communication and sharing of information and best practices are in particular essential between the main coordination frameworks and mechanisms for United Nations system 25 See e.g. Development Forum on Maximizing Civil Aviation s Economic Contribution by Providing Safe, Secure and Sustainable Air Transport in African Skies, April 2007, hosted by the African Union (AU) in association with the International Civil Aviation Organization, the World Bank and the Air Transport Action Group. 26 See e.g. the Connect Africa initiative in which the International Telecommunication Union, the Economic Commission for Africa (ECA), the AU, the African Development Bank (AfDB) and the World Bank, among others, have a major stake. 27 CEB/2007/2, para See annexes II and III of the present report. 29 E/2008/58, para.17. 19 9 were discussed. 30 Another good example, which illustrates the contribution the CEB can make, is the discussion held at the CEB in 2008 on issues relating to the food crisis in Africa. 35. 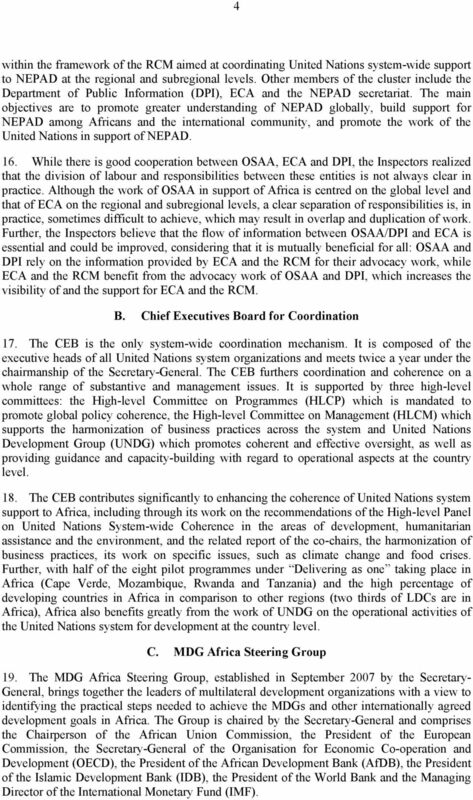 Because of the unique role of the CEB as the only system-wide coordination mechanism, the Inspectors believe that it is in a privileged position to play a more proactive and substantive role with regard to enhancing coherence and coordination of United Nations system support to Africa. Only a stronger CEB, with an extended mandate to foster integration and coherence across the United Nations system, can provide a forum for bringing together all stakeholders at the highest organizational level on a regular and consistent basis. To that end, one important step would be to make support to Africa a regular, standing item on the agendas of the CEB and its three pillars. This idea was widely shared during the discussions of the Inspectors with officials and representatives both at headquarters and in the field. Further, given the integration of UNDG into the CEB structures, the CEB now has also a major stake in promoting coherence and coordination at the country level. 36. 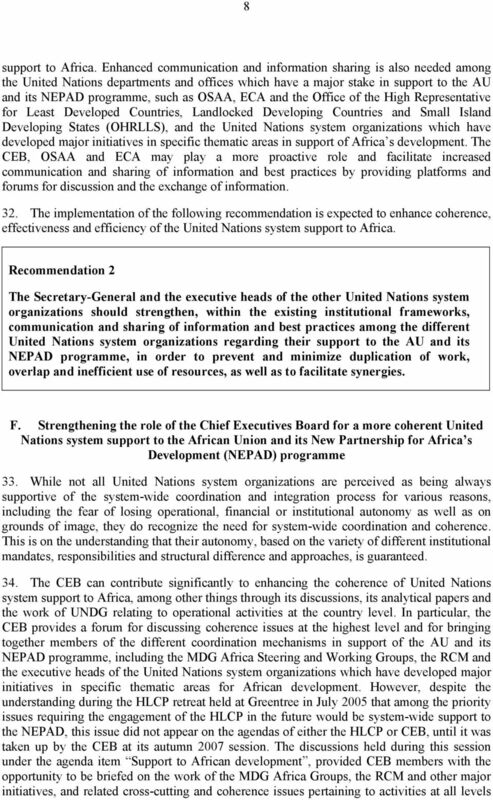 For these reasons, the Inspectors are of the opinion that the Secretary-General, in his capacity as Chairman of the CEB, should include support to the AU and its NEPAD programme as a regular, standing item on the agenda of the CEB, in order to provide a forum for discussion on coordination and coherence issues relating to United Nations system support to Africa at the highest organizational levels on a consistent basis. III. ENHANCING COHERENCE AT THE REGIONAL AND SUBREGIONAL LEVELS: STRENGTHENING THE REGIONAL COORDINATION MECHANISM 37. In response to Economic and Social Council resolution 1998/46 which called for the regular holding of regional consultations among United Nations organizations, the first of such consultations on Africa was held in Nairobi in March In 2002 during the fourth regional consultations meeting and in line with General Assembly resolutions 57/2 and 57/7 requesting that NEPAD should be the framework within which the international community, including the United Nations system, should concentrate its efforts for Africa s development, five thematic clusters were established to better respond to NEPAD priorities. The number of clusters later evolved from five to seven in 2004 and nine in 2006 with ten sub-clusters reflecting NEPAD priorities The regional consultations meetings (now renamed the Regional Coordination Mechanism (RCM)), 32 provide a framework and mechanism to enhance system-wide coordination and cooperation between the different United Nations system organizations in implementing their work programmes in Africa. The RCM, organized around nine thematic clusters, 33 is convened by a designated United Nations system agency and co-chaired by the AU. Cluster coordinators and members, together with international and African partners, hold annual consultation meetings at ECA in Addis Ababa under the chairmanship of the Deputy Secretary-General and co-chaired by the AU, providing a forum for discussion and for reviewing activities pertaining to the RCM and its clusters. 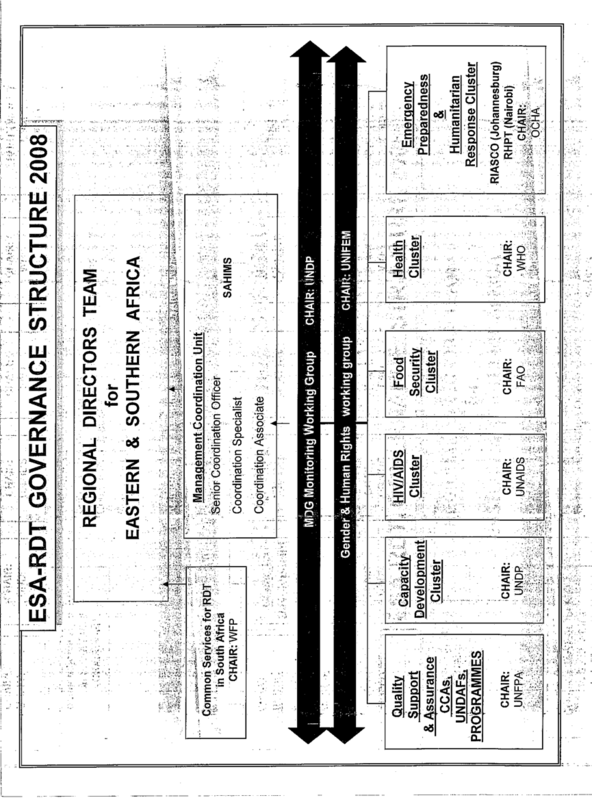 Administrative, organizational and 30 See CEB/2007/2, para See annex II of the present report. 32 See footnote See annex II of the present report. The thematic areas of the nine clusters are: infrastructure development, water and sanitation, energy, transport and ICTS; governance; peace and security; agriculture, food security and rural development; industry, trade and market access; environment, population and urbanization; social and human development; science and technology; advocacy and communications. 20 10 institutional support is provided by the RCM secretariat based at ECA and by the United Nations system agencies which chair clusters and sub-clusters 39. The RCM and its cluster system have been subject to various reviews by United Nations entities, including the Secretariat, ECA and JIU, 34 and by external consultants with a view to identifying and proposing measures to enhance the effectiveness and efficiency of the RCM and its cluster system. As a result of the partial implementation of the recommendations made, some progress can be noted as regards increased effectiveness of the RCM in terms of enhanced leadership and the repositioning of ECA as RCM strategic coordinator; increased interaction within and among clusters; and the development of business plans for some clusters. Further, there is increased participation of United Nations system organizations and African regional (AU, NEPAD secretariat, AfDB) and subregional organizations (regional economic communities) in the RCM process. 40. Nevertheless, significant challenges and constraints remain, as identified during the annual meetings of the RCM 35 and as indicated to the Inspectors. There is, in particular, a strong need for further commitment and leadership; increased accountability; enhanced coordination and collaboration; increased resource mobilization and capacity-building; more systematic monitoring and evaluation; and increased communication, outreach and advocacy. In addition, the activities of the RCM need overseeing and there is a requirement for further alignment of the activities of the cluster system within the framework of the United Nations Ten-Year Capacity-building Programme for the African Union; for mainstreaming of crosscutting issues such as gender, health and culture into the work of the RCM; and for addressing regional integration issues. 41. Various recommendations were made during the annual meetings of the RCM to address these challenges and shortcomings which are inhibiting the effective and efficient functioning of the RCM, but many of them are not or not yet fully implemented. The Inspectors, building on the observations and recommendations made in the available reviews of the RCM, have focused on selected issues which, in their view, are particularly important for enhancing the effectiveness and efficiency of the RCM and its cluster system. A. Establishing a steering committee for the Regional Coordination Mechanism 42. Among the proposals for strengthening the RCM was the establishment of a high-level steering committee, composed of representatives of the clusters, ECA, OSAA, the AU Commission and the NEPAD secretariat, to oversee the activities of the RCM and its clusters, to provide guidance, and to follow up on the decisions and implementation of the various recommendations relating to the RCM and its cluster system. The recommendation for establishing such a steering committee was formally adopted during the eighth annual consultations meeting of the RCM held in Addis Ababa in November The Inspectors were informed that consultations on the establishment of a steering committee for the RCM have started and that it was envisaged to have it set up during While the need for such a committee was generally recognized by the majority of RCM members and stakeholders, 37 there were different views on its exact design. 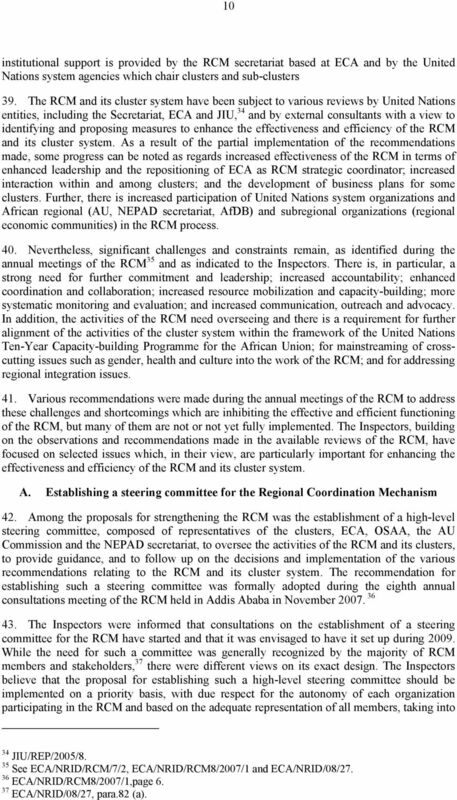 The Inspectors believe that the proposal for establishing such a high-level steering committee should be implemented on a priority basis, with due respect for the autonomy of each organization participating in the RCM and based on the adequate representation of all members, taking into 34 JIU/REP/2005/8. 35 See ECA/NRID/RCM/7/2, ECA/NRID/RCM8/2007/1 and ECA/NRID/08/ ECA/NRID/RCM8/2007/1,page ECA/NRID/08/27, para.82 (a). 22 Following this recommendation, the NEPAD and Regional Integration Division (NRID) of ECA was strengthened and the RCM secretariat, part of the NRID, was established at ECA headquarters in Addis Ababa. Besides the preparation and organization of the annual consultations and other meetings related to the RCM, the NRID and the RCM secretariat provide a broad range of administrative, organizational and institutional support to the RCM and its clusters. The RCM secretariat acts as a focal point for sharing information on the work, the meeting schedules and the decisions of each cluster, and follows up on decisions and recommendations taken during the annual consultation meetings. It also assists in outreach and advocacy activities related to the RCM. Other initiatives undertaken by the secretariat include the preparation and disbursement of three-year model business plans for the clusters and the launch of a knowledge management platform, including an e-discussion platform, to facilitate and enhance knowledge sharing and collaboration between clusters. 49. This proactive role of ECA as an effective strategic coordinator of the RCM and its cluster system is expected to lead to the revitalization and strengthening of the Mechanism. However, many challenges and shortcomings still exist. For example, sharing of information and communication among the clusters on their work and meeting schedules is behind expectations, as is the adoption of business plans for each cluster. In this regard, in the view of the Inspectors two issues should be addressed: the fact that ECA can play the role of a coordinator, but not implementer, should be emphasized and adequate resources should be provided to ECA in order to ensure that it effectively fulfils the role of strategic coordinator. 50. The issue of adequate resources was also brought up by many participants and stakeholders of the RCM during the discussions and meetings held by the Inspectors. For example, it was mentioned that a press liaison officer at ECA, who would report on a periodic basis on the achievements, successes and challenges of the work of the RCM and its clusters in support of the AU and its NEPAD programme, would greatly facilitate and enhance the outreach and advocacy activities both at ECA and United Nations Headquarters. This, in turn, would also benefit capacity-building and resource mobilization activities. The need for strengthening ECA with regard to its support to the RCM was also recognized by a recent OIOS report which states: The capacity of ECA to backstop RCM seems limited, with five staff members and a budget equivalent to 0.03 per cent of the total expenditure of the United Nations system in Africa. Capacity would be seriously inadequate should ECA seek a more proactive role in facilitating cluster coordination and interaction between clusters The Inspectors concur with these views and support the Secretary-General s position as expressed in his 2008 report on Africa s development needs, in which he stated: The [Regional Coordination] Mechanism s clusters should be provided with sufficient dedicated resources to ensure effective coordination and maximum impact. Furthermore, the secretariat of the Regional Consultations Mechanism located at ECA should be strengthened to ensure that it can effectively execute its strategic coordinating role While they welcome recent General Assembly resolution 63/260 and the preliminary steps taken by the Secretary-General, the Inspectors expect further measures will follow towards strengthening ECA, including, as appropriate, redeployment of resources, to enable it to effectively undertake its strategic coordinating role with regard to the RCM, under the guidance of the proposed high-level steering committee and of the members of the RCM. 53. Implementation of the following recommendation is expected to enhance the effectiveness and efficiency of the RCM and its cluster system. 40 E/AC.51/2009/2, para A/63/130, para.76. 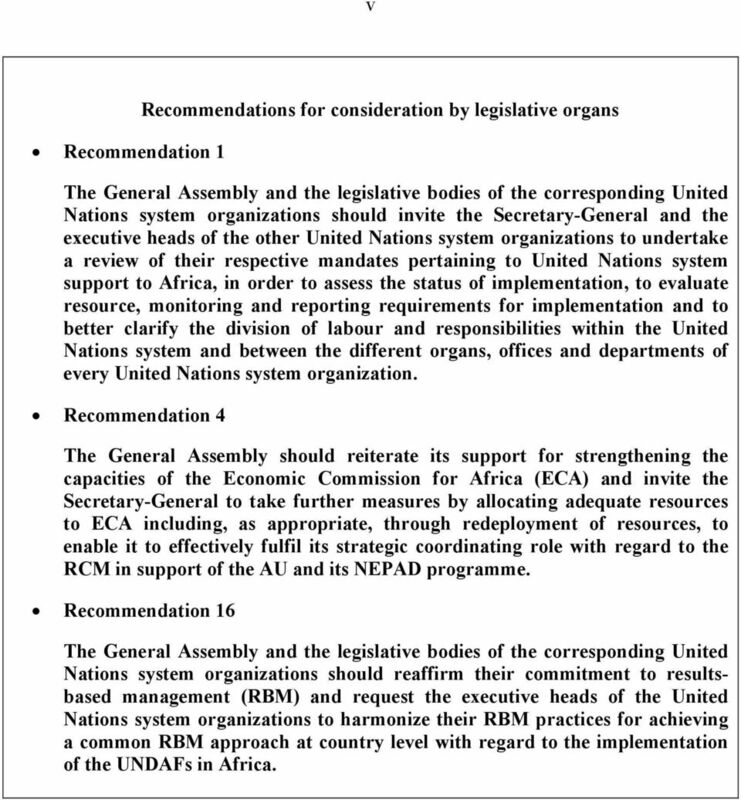 23 13 Recommendation 4 The General Assembly should reiterate its support for strengthening the capacities of the United Nations Economic Commission for Africa (ECA) and invite the Secretary-General to take further measures by allocating adequate resources to ECA including, as appropriate, redeployment of resources, to enable it to effectively fulfil its strategic coordinating role with regard to the RCM in support of the AU and its NEPAD programme. C. Aligning the Regional Coordination Mechanism and its clusters with the needs and priorities of the African Union and its NEPAD programme 54. The RCM, since its establishment in 2002, has become the principal mechanism for coordinating United Nations system-wide support to NEPAD at the regional and subregional levels with its nine thematic clusters covering the priority areas of NEPAD. 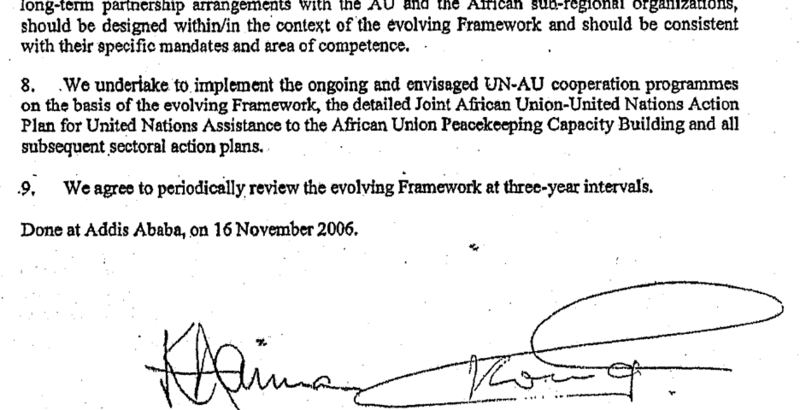 Since the 2003 Maputo Declaration on the integration of NEPAD into the structures and processes of the AU, 42 United Nations support for African development is reflecting AU priorities In response to the 2005 World Summit Outcome, 44 the executive heads of the United Nations system organizations and the AU Commission signed in November 2006 a declaration entitled Enhancing UN-AU Cooperation: Framework for the Ten-Year Capacity- Building Programme for the African Union. 45 This comprehensive and evolving framework aims to clarify the areas, forms, and scale of the response of the United Nations system to the capacity needs of the AU, including the integration of NEPAD into AU structures and processes. 56. 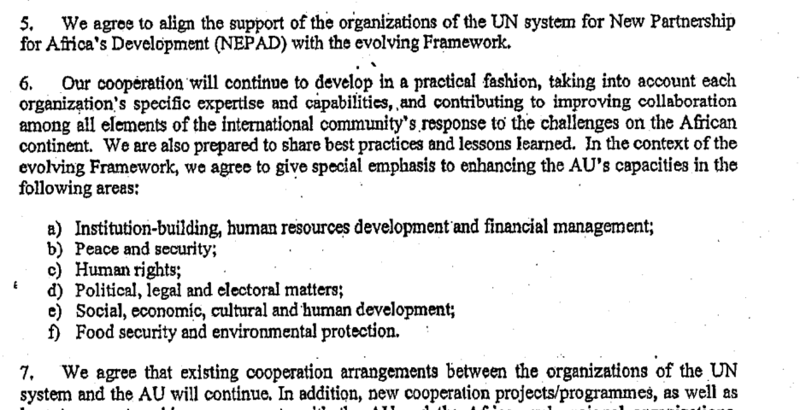 In order to improve the alignment of United Nations system support to the AU and its NEPAD programme, the following four recommendations were made during the eighth annual consultation meeting of the RCM held in Addis Ababa in November 2007: (a) The Framework for the Ten-Year Capacity Building Programme for the African Union is an evolving document, which should be further developed to serve as the overall coordination framework for existing cooperation and bilateral agreements between United Nations agencies and the AU, and should form the basis for United Nations assistance to AU capacity building; (b) The AU Commission should provide leadership on the further development and implementation of the Programme, in order to ensure that the priority needs of all its departments are adequately addressed; (c) The internal coordination mechanism of the AU Commission should be strengthened to enhance linkages between its departments, as well as to ensure that the support being provided under the Programme is utilized optimally; 42 The need for integrating NEPAD into AU structures and processes was first recognized by the African Heads of State at the second ordinary session of the Assembly of AU held in Maputo in 2003 (Maputo Declaration), and reaffirmed at the 18th NEPAD Heads of State and Government Implementation Committee Summit held in Algiers, Algeria, on March 21, 2007 and at the tenth AU Assembly held in Addis Ababa in January/February See also General Assembly resolution 61/ See General Assembly resolution 60/1, paras 68 and A/61/630, annex, reproduced at annex I of the present report). 24 14 (d) The AfDB should be invited to provide support for the implementation of the Programme Following these recommendations, an active consultation process, including a comprehensive review meeting held in March 2008, has started between RCM members and representatives of the AU Commission to discuss the further development and implementation of the Ten-Year Capacity Building Programme. In its leadership capacity, the AU Commission will present in matrix form the needs and priorities identified by its different departments for consideration by the organizations and agencies participating in the RCM. In consultation with these organizations a final document should be elaborated and annexed to the Programme. 58. In addition, the nine thematic clusters of the RCM are, to various degrees, aligning their activities with the priorities of the AU and its NEPAD programme, and with the priorities of the AU sectoral Ministerial Bodies as outlined in annex IV. 59. During the meetings and discussions with representatives of the AU Commission and ECA, the Inspectors noted that the implementation of these recommendations is still work in progress and will be finalized in due course on a priority basis. The importance of recognizing the leadership role of the AU Commission was highlighted, and so was the evolving character of the Ten-Year Programme. In this context, it was mentioned that there is a need for better mainstreaming of cross-cutting issues such as gender, health, culture and regional integration, including more involvement of the regional economic communities (RECs) in the Programme. The Programme should also be able to accommodate current and urgent issues such as food crises and climate change. 60. Another issue raised with the Inspectors was the duality between the AU and its NEPAD programme. Despite the fact that the decision has been taken to integrate NEPAD into the AU structures and processes, confusions, uncertainties and sometimes reluctance remain with regard to the exact roles, responsibilities and division of labour between the AU and NEPAD. There was consensus among the officials met by the Inspectors that this situation impedes the alignment of United Nations support to the AU and its NEPAD needs and priorities. It was proposed that the AU Commission and the NEPAD secretariat should intensify their efforts to finalize the process of integrating NEPAD into the AU. 61. The Inspectors believe that further and continuous alignment of the RCM and its clusters with the needs and priorities of the AU - including the needs and priorities of its Specialized Technical Committees (African Ministerial Bodies) - and its NEPAD programme will result in a more effective and efficient RCM while, at the same time, underlining the leadership role of the AU Commission. The United Nations Liaison Office with the African Union (UNLO/AU), currently composed of only two staff, should be adequately strengthened and closely involved in the consultation, follow-up and monitoring process. 62. The implementation of the following recommendation is expected to enhance the effectiveness and efficiency of the RCM and its cluster system. 46 ECA/NRID/RCM8/2007/1, page 10. 27 17 and cluster activities, would facilitate and contribute to enhanced communication and information sharing within the RCM. 74. The implementation of the following recommendation is expected to enhance the effectiveness and efficiency of the RCM and its cluster system. 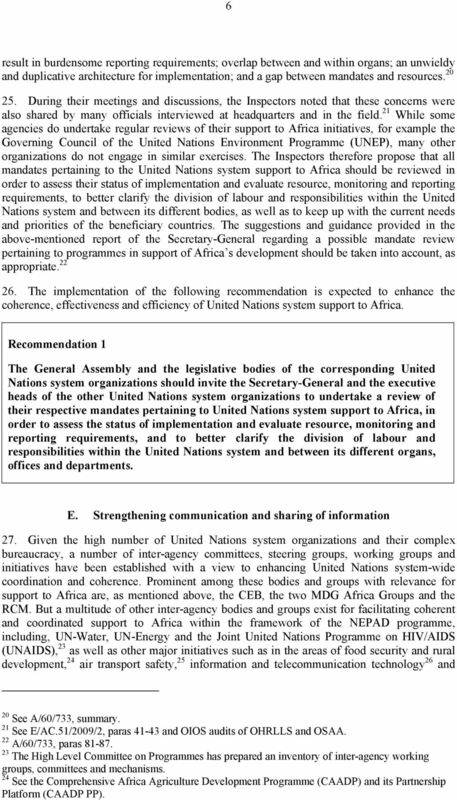 Recommendation 7 The Secretary-General and the executive heads of the other United Nations system organizations should assign senior focal points for interaction with the RCM secretariat and other participants, including the African Union Commission and the regional economic communities, in order to enhance communication and information sharing within the mechanism. 3. Interaction of the Regional Coordination Mechanism with the Regional Directors Teams 75. There are two Regional Directors Teams (RDTs) in Africa, one for eastern and southern Africa and the other for western-central Africa. Their objectives are the provision of technical support to Resident Coordinators and the United Nations country teams (UNCTs); quality support and assurance of the common country programming (UNDAF) process; performance appraisal and oversight of Resident Coordinators and the UNCTs; and troubleshooting in difficult country situations, dispute resolution etc. The RDTs are composed of representatives of United Nations system organizations based in the respective region and their structure consists of a secretariat, technical clusters and advisory groups. 76. The Umbrella Agreement between the regional commissions and UNDP (which is also the chair of UNDG) of October 2007 (superseding the strategic compact signed in 2000), provides, with regard to Africa, the basis for collaboration between the ECA and the two RDTs in Africa. The agreement is broad in scope and specifically recognizes support to regional coordination mechanisms with the aim of maximizing the complementarities between the Regional Commissions and UNDP, as well as cooperation at country, regional and global levels ( UN Coherence at the Regional Level, Synergies and Complementarities Between the Regional Coordination Mechanism and Regional Directors Team, ECA, July 2008, page 22). 77. However, there is a lack of implementation and operationalization of this agreement, in particular as it concerns communication and coordination between ECA and the RDTs. During their meetings, the Inspectors noted that the participants of the RCM have limited knowledge about the RDTs and the UNCTs, and vice versa. This lack of communication and coordination prevents synergies and opens the door for overlaps, in particular as the RDTs and the RCM have similar areas of activities. For example, the eastern and southern Africa RDT technical clusters deal with HIV/AIDS, health, food security, and gender and human rights issues which are also addressed by many of the nine thematic clusters of the RCM This communication gap between the RDTs and ECA was also discussed at the 2009 retreats of the two RDTs in Africa and it was unanimously agreed by all members that greater engagement is required with ECA. The RDT for eastern and southern Africa has already developed a strategy to that effect and a capacity assessment of the RDTs organized by the 47 See annexes II and V of the present report. 28 18 United Nations Development Operations Coordination Office (DOCO) is underway to identify the gaps and determine how these can be reduced. The Inspectors welcome these efforts, but they believe that further measures are needed to better implement and operationalize the umbrella agreement, in order to enhance communication, coordination and cooperation between the partners involved. 79. The implementation of the following recommendation is expected to facilitate and enhance communication, coordination and cooperation between ECA and the RCM on one side and UNDP and the RDTs on the other. Recommendation 8 The Secretary-General and the Administrator of UNDP should ensure that the Umbrella Agreement between the regional commissions and UNDP, signed in October 2007, is fully implemented and operationalized in order to facilitate and enhance communication, coordination and cooperation between ECA and the RCM on one side and UNDP and the RDTs on the other. 4. Interaction of the Regional Coordination Mechanism with the African Peer Review Mechanism 80. The African Peer Review Mechanism (APRM) is a mutually agreed instrument for selfmonitoring by the participating member Governments with regard to the commitments outlined in the Declaration on Democracy, Political, Economic and Corporate Governance adopted at the Organization of African Unity (OAU) Summit in July 2001 in Lusaka, Zambia. 48 The base document of the APRM was approved by the NEPAD Heads of State and Government Implementation Committee and later endorsed by the African Union Summit in Durban, South Africa, in July The APRM is a voluntary mechanism open to all member States of the African Union. As of July 2008, 29 countries had formally joined the APRM by signing the memorandum of understanding. A number of AU Commission officials met by the Inspectors asserted that they are not sufficiently briefed and informed on the activities of the APRM. 81. As of July 2008, the APRM, which is headquartered in Midrand, South Africa, had no legal standing in South Africa. The APRM bank account is managed by the Development Bank of Southern Africa (DBSA) for transactions like salaries, travel, office rental and related facilities. According to some AU and UNDP sources, serious issues, such as the legal presence of the APRM in South Africa, transparency and accountability regarding its work and functioning, and the lack of compliance with AU financial rules and regulations should be properly addressed and urgently resolved. 82. Given the similar areas of work of the governance cluster of the RCM and the APRM secretariat, and the fact that there is only limited communication and coordination between these two entities, the Inspectors believe that regular and consistent sharing of information, experience and lessons learned between these two bodies is essential for avoiding duplication of work and for achieving synergies. 48 The African Peer Review Mechanism trust fund has a budget of US$7 million to which UNDP contributes US$2.75. The trust fund supports the personnel of the secretariat and the activities of both the Panel and the secretariat of the Mechanism, including meetings and the publications of reports, see E/AC.51/2008/5, para. 82. 30 20 eight regional economic communities (RECs) in Africa, which are the principal building blocks and vehicles for regional and subregional integration The difficulties identified during these consultations and discussions included, inter alia, the multiplicity and overlaps of RECs making it difficult to base the mechanism upon them; the varying structures of United Nations system agencies at the regional, subregional and country levels, with many United Nations organizations having no subregional presence but instead regional and national presences; the different understanding of the African subregions among stakeholders; and the lack of capacities and resources of United Nations system organizations for subregional coordination. These concerns were widely shared during the discussions held by the Inspectors with officials of the United Nations system and its African partners, including the AU Commission, the NEPAD secretariat and the RECs. 89. In response to General Assembly resolution 60/235 of 8 February 2006 following an OIOS report on the subregional offices of ECA, 52 the Secretary-General submitted his report Enhancing the role of the subregional offices of the Economic Commission for Africa, 53 complemented by a comprehensive review by the Executive Secretary of ECA aimed at repositioning the Commission to better respond to the challenges facing Africa. In resolution 62/208, the General Assembly reaffirmed the need for strengthening the capacities of the regional commissions at the regional and subregional level and the need for more effective and closer coordination and cooperation among United Nations system organizations at these levels. 90. The Inspectors firmly support these reform endeavours and are of the opinion that the Secretary-General should expedite the implementation of the pertinent General Assembly resolutions aimed at strengthening the capacities of ECA and its subregional offices in support of the AU and its NEPAD programme at the regional and subregional levels, and report thereon to the General Assembly at its sixty-sixth session. Reference is also made to recommendations 3 and 4 above. 91. Similarly, with regard to the proposed establishment of a system-wide subregional coordination mechanism within the RCM framework, the Inspectors believe that, for the reasons spelt out in the paragraphs above, the process should be speeded up and finalized as soon as possible. 2. Integrating the regional economic communities into the system-wide subregional coordination mechanisms 92. The eight RECs in Africa, as the principal building blocks and vehicles for regional integration and for the implementation of the AU and its NEPAD programme at the subregional level, are expected to be important partners of the United Nations system organizations. Interactions between the RECs and the United Nations system are either established on a bilateral basis between the regional or subregional offices of the organizations concerned, through the UNCTs of the respective countries represented by the Resident Coordinators or through the subregional offices of ECA. 51 The Arab Maghreb Union (UMA); the Common Market for Eastern and Southern Africa (COMESA); the Community of Sahel-Saharan States (CEN-SAD); the East African Community (EAC); the Economic Community of Central African States (ECCAS); the Economic Community of West African States (ECOWAS); the Intergovernmental Authority on Development (IGAD); and the Southern Africa Development Community (SADC). 52 A/60/120. ECA has five subregional offices located in Yaoundé (central), Kigali (east), Tangier (north), Lusaka (south) and Niamey (west). 53 A/61/471. 31 During their consultations with officials of the United Nations system and the RECs, the Inspectors were informed that good working relations with the United Nations system exist. However, they discovered that there is poor knowledge within the RECs of the work of the RCM and its clusters. The Inspectors think that the RECs should be more closely involved in the work and activities of the RCM, taking into account their important role for the regional integration process and for the implementation of the AU NEPAD programme at the subregional levels. This would also ensure that the needs and priorities of the RECs are adequately taken into consideration. 94. Many United Nations system organizations with regional or subregional presences are not formally accredited to the RECs of the respective region or subregion but the Inspectors strongly believe that they should be thus accredited through their regional/subregional offices, in order to facilitate interaction, coordination and cooperation between the United Nations system and the RECs. 95. The implementation of the following recommendations is expected to enhance the effectiveness, efficiency and coherence of the United Nations system support to Africa at the regional and subregional levels. Recommendation 10 The Secretary-General and the executive heads of the other United Nations system organizations should closely involve the regional economic communities (RECs) in Africa in the work and activities of the RCM and its cluster system so as to have the needs and priorities of the RECs coherently reflected within the RCM framework. Recommendation 11 The Secretary-General and the executive heads of the other United Nations system organizations should encourage all United Nations system organizations, as appropriate and in consultation with UNDG and the RDTs, to be accredited through their regional/subregional offices to the RECs in Africa, with a view to facilitating interaction, coordination and cooperation between the United Nations system and the RECs. 96. 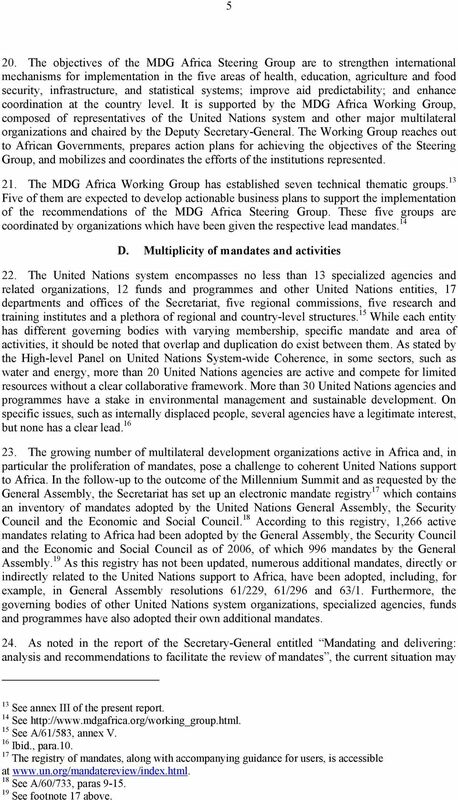 Other issues were brought up in this context such as the multiplicity of the RECs, their overlapping membership, which often does not correspond to the five geographic subregions of Africa 54 and the limited capacities and resources of many of the RECs, which are considered impediments to their effective functioning and to their interaction and cooperation with the United Nations system. Renewed attempts have been made to strengthen the RECs and the coordination and cooperation among them, as illustrated by the joint retreat of all RECs convened in August 2008 in Ouagadougou. A common vision was proclaimed and it was reaffirmed that the RECs should implement their programmes through NEPAD, reinforce 54 In many cases, the eight RECs are composed of member countries from several of the five geographic subregions of Africa and one of them is composed of almost half of all AU member countries from all but one subregion. 32 22 their relationship and cooperation with all partners, better link their work to the MDGs, and focus on implementation. 97. Yet, some of the representatives of the RECs met by the Inspectors, confessed their disappointment and preoccupation regarding the recurrent issue of the number and membership of the RECs which should, in their view, be streamlined in order to match the five geographic subregions of Africa. The Inspectors agree with this opinion, since the proposed streamlining of the RECs would clarify the situation and help to strengthen regional integration, in addition to the pivotal role of the RECs in the coherent, effective and efficient implementation of the AU NEPAD programme at the subregional level. IV. ENHANCING COHERENCE AT COUNTRY LEVEL 98. At country level, the United Nations country teams (UNCTs), led by the Resident Coordinators, are the main coordination mechanisms. They are guided by the respective Common Country Assessments (CCAs) and the United Nations Development Assistance Frameworks (UNDAFs) aligned to the respective national priorities and under the ownership of the beneficiary countries. While UNCTs do not exist in all African countries, there are now more than 45 of them and about 52 Resident Coordinators operating in Africa. In addition, four of the eight Delivering as one pilot countries 55 and most self-starter countries (e.g. Botswana, Malawi and Mali) are in Africa. The UNCTs and the Resident Coordinators are supported by the two Regional Directors Teams (RDTs) for Africa and UNDG, with a view to facilitating and enhancing system-wide coherence, coordination and integration of operational aspects at the country level. 99. Given the ongoing reform processes and the numerous reviews and evaluations conducted with a view to enhancing the coherence, effectiveness and efficiency of United Nations system support at the country level, 56 this JIU evaluation focuses on some selected issues which, in the Inspectors view, appear noteworthy. A. Strengthening national ownership and leadership 100. As recognized and reaffirmed by numerous General Assembly resolutions, as well as by the beneficiary countries and African development partners, national ownership and leadership should be the guiding principle for all operational activities of the United Nations system at the country level. 57 This would also ensure that the United Nations system addresses the specific needs and priorities of the beneficiary countries, hence contributing to making United Nations system support more integrated and effective at the country level. In this context, the CEB emphasized in 2005 that The system s effort in support of NEPAD should be sustained and proactive, while remaining sensitive to Africa s ownership of the programme. 58 At the same time, national ownership and leadership entail increased responsibilities and accountability on the part of the beneficiary Governments The Inspectors welcome the progress that has been made in safeguarding the ownership and leadership of the beneficiary Governments, in particular through the introduction of the 55 Cape Verde, Mozambique, Rwanda and Tanzania. 56 See A/62/73-E/2007/52, A/61/836, A/61/583, A/59/387, A/56/320, and E/2008/ See, for example, resolution 62/208, para. 10, and the statement of the participating countries in the Delivering as one pilots, adopted in Maputo on 23 May 2008, paras 13-17, available at One-Summary.pdf. 58 CEB/2005/1, para.13. 33 23 UNDAFs. They further note that the operationalization and implementation of the UNDAFs by the UNCTs contributes to improved involvement of the beneficiary Governments which, instead of dealing with a fragmented and multifaceted United Nations system, now interact and communicate with the system through the UNCTs led by the Resident Coordinators While the beneficiary authorities in most countries are more or less involved in the development and implementation of the UNDAFs, this is not the case in all African countries, particularly where the respective UNDAF does not incorporate all country programmes. Similarly, national ownership and leadership is also impeded in countries which do not have UNDAFs. Finally, the Inspectors wish to emphasize that national ownership and leadership also serves as a means for the United Nations system to address the specific needs and priorities of the African beneficiary countries, including strengthening their national institutional capacities with regard to the management, implementation, monitoring and evaluation of the programmes and projects under the pertinent UNDAFs, as recommended by the JIU report entitled National Execution of Technical Cooperation Projects (JIU/REP/2008/4) The implementation of the following recommendation is expected to ensure national ownership and leadership with regard to United Nations system activities in support of Africa at the country level. Recommendation 12 The Secretary-General and the executive heads of the other United Nations system organizations should ensure that the African beneficiary Governments are always closely engaged in the development, implementation and monitoring of the United Nations Development Assistance Frameworks, in order to foster national ownership and leadership and to enable their organizations to address the specific needs and priorities of the beneficiary countries, including the strengthening of their national institutional capacities B. Strengthening the capacities of the Regional Directors Teams The two RDTs in Africa - the RDT for Eastern/Southern Africa and the Western/Central Africa RDT - play an important role in supporting the UNCTs in their regions in advancing the United Nations coherence agenda and enhancing strategic programming, resource mobilization and partnership-building. The RDT for Eastern and Southern Africa also undertakes an annual performance assessment of the Resident Coordinator and the UNCTs, and its regional management undertakes oversight and mediation missions to countries and to regional bodies such as the Southern Africa Development Community (SADC) The Inspectors, during their consultations with representatives of the different UNCTs, learned that the two RDTs, despite their core function at the country level, do not really 59 See Recommendations 5, 6 and The concept of the RDT was formally initiated in 2005 with the RDT pilot for Eastern/Southern Africa addressing the triple threat of HIV/AIDS, food security and weakened capacity. The scope/mandate of the RDTs has since evolved around two predominant elements: coordinated programme support to UNCTs and coherent oversight of Resident Coordinators/UNCTs. Support to crisis/emergencies, MDGs and issues such as mapping of expertise have also been on the agenda in some cases. 34 24 possess the necessary capacities and resources to adequately fulfil this role. This is especially crucial considering the extensive ongoing reform processes and the relatively recent establishment of the UNCTs and the Resident Coordinator system Therefore, the Inspectors believe that stronger and better resourced RDTs for Africa, including the participation of African partners, such as the AU, could make a significant contribution towards advancing system-wide coherence and coordination at the country level, and strengthening the UNCTs and Resident Coordinator system in their respective regions. It should also be taken into account that many country programmes are not limited to a specific country but also have a subregional or regional dimension, as is the case with anti-trafficking programmes which have by nature a transboundary dimension, but this also applies to health, environmental or trade and industrial development programmes. The RDTs, in coordination with ECA, would be in a position to take into consideration the subregional and regional dimensions. 61 The observations and findings of the capacity assessment of the two RDTs in Africa, which is currently being conducted by DOCO, should be taken into account The Inspectors are also of the view that the experiences and lessons learned at the country level should be shared among the different UNCTs, extended to the Delivering as one pilot and self-starter countries in Africa, and taken up by the two RDTs for Africa at the regional and subregional level and with UNDG at the global level. Reference is also made to Recommendation 8 above in this regard The implementation of the following recommendation is expected to enhance the effectiveness, efficiency and coherence of the United Nations system support to Africa. Recommendation 13 The Secretary-General and the executive heads of the other United Nations system organizations should further strengthen the capacities and resources of the two Regional Directors Teams in Africa including, as appropriate, through redeployment of resources, to ensure their effective functioning in the context of the extensive ongoing reform processes aimed at enhancing system-wide coherence and coordination at the country levels. C. Aligning planning, programming and budget cycles 109. Another issue raised during the discussions held by the Inspectors was the need for further aligning the planning, programming and budget cycles of the United Nations system organizations operating in a respective country. While progress in system-wide cooperation and coordination at the country level has been achieved through the UNDAF frameworks, more efforts still have to be made in better linking the country programmes of the individual organizations to the UNDAFs and in harmonizing their planning, programming and budget cycles. This would provide the basis for more extensive joint programming and for establishing a joint monitoring and evaluation framework. It would also facilitate resource mobilization Furthermore, harmonized planning, programming and budget cycles would allow for simplifying reporting requirements. The Inspectors have learned that some of the beneficiary Governments were overwhelmed by the multiplicity of reports provided by the different 61 See also Recommendation 10 of JIU/REP/2008/4. 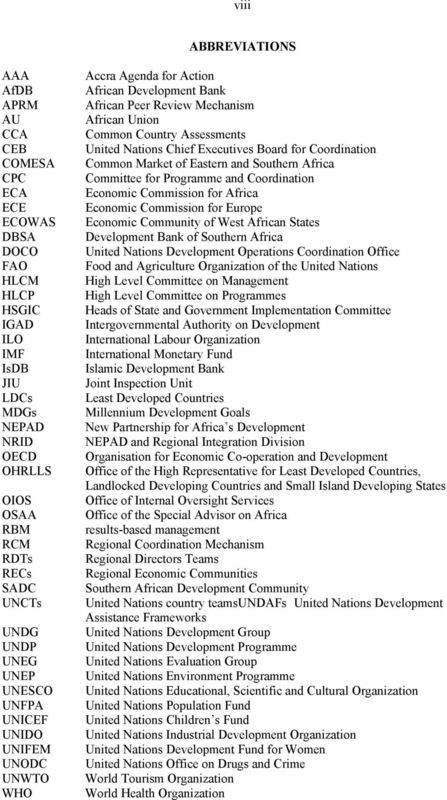 35 25 United Nations system organizations. Having a better system-wide alignment of planning, programming and budget cycles around the UNDAF frameworks would provide for simplified reporting arrangements, or a common reporting arrangement, to the beneficiary countries on country level activities Despite the drawbacks and existing challenges, progress has been made in establishing measures for a more harmonized and coherent United Nations system. In this context, the Inspectors welcome the work done by the CEB in support of enhancing uniformity of administrative, financial and budgetary procedures and practices, for example through the development of harmonized business practices for the United Nations system. Further, the UNDAF frameworks and the implementation of the Delivering as one approach in the African pilot and self-starter countries, greatly contribute to a more harmonized and coherent United Nations system at the country level Moreover, as the Inspectors were informed, joint programming in implementing the UNDAFs is increasing, although still limited. Good examples are the programmes in various African countries to combat HIV/Aids implemented under the guidance of UNAIDS, and gender mainstreaming programmes executed under the lead of the United Nations Development Fund for Women (UNIFEM). 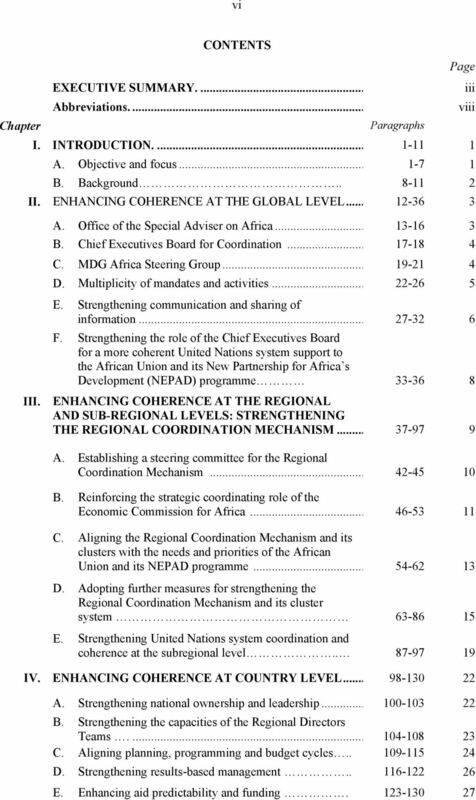 However, there is a need to improve the alignment of the planning, programming and budget cycles of the United Nations system organizations country programmes with the respective UNDAFs The implementation of the following recommendations is expected to enhance the effectiveness, efficiency and coherence of United Nations system support to Africa at the regional, subregional and country levels. Recommendation 14 The Secretary-General and the executive heads of the other United Nations system organizations should ensure that the planning, programming and budget cycles of their country programmes in Africa under the respective UNDAFs are better aligned in order to allow for more extensive joint programming and the establishment of joint monitoring and evaluation frameworks, as well as simplified reporting arrangements at the country level There is also a need for better aligning the planning, programming and budget cycles of the country programmes with those of subregional and regional programmes in order to achieve increased coordination and coherence at these three levels. The Inspectors understand that, without proper alignment, it would often be difficult to coordinate the implementation of country projects and regional/subregional projects because of different sources of funding, project cycles and reporting mechanisms. This is important as national projects in most cases also have a regional/subregional dimension, e.g. trade and cross-border smuggling, or disposal of waste across borders The implementation of the following recommendation is expected to enhance the effectiveness, efficiency and coherence of the United Nations system support to Africa at the regional, subregional and country levels. 36 26 Recommendation 15 The Secretary-General and the executive heads of the other United Nations system organizations should ensure that the planning, programming and budget cycles of the country programmes in Africa are aligned with those of the regional and subregional programmes, in order to achieve increased coordination and coherence. D. Strengthening results-based management 116. According to the general understanding, results-based management (RBM) is a life cycle approach to management, integrating strategy, people, resources, processes and measurements to improve decision-making, transparency, monitoring and accountability. The RBM approach, promoted by the JIU (JIU/REP/2004/5), focuses on achieving outcomes and results, performance measurement, learning and changing In 2004, the JIU prepared a series of reports on RBM including a benchmarking framework for its implementation (JIU/REP/2004/5, JIU/REP/2004/6, JIU/REP/2004/7 and JIU/REP/2004/8). The CEB invited all UN System organizations to endorse the JIU benchmarking framework for RBM and to use it as the chapeau for their respective implementation of RBM. 62 The JIU RBM benchmarking framework was subsequently endorsed by the General Assembly The JIU comprehends RBM as a management approach focused on achieving results, a broad management strategy aimed at changing the way agencies operate, with improving performance (achieving results) as the central orientation. 64 Key RBM techniques include formulating objectives (results); selecting indicators to measure progress towards each objective; setting explicit targets for each indicator to judge performance; regularly collecting data on results to monitor performance; reviewing, analysing and reporting actual results visà-vis the targets; integrating evaluations to provide complementary performance information; and using performance information for purposes of accountability, learning and decisionmaking Most of the United Nations system organizations have adopted an RBM approach and are in the process of strengthening it both at headquarters and in the field. The implementation of RBM at the country level, including in Africa, is guided by the respective RBM manuals of the United Nations system organizations and the guidelines for the UNCTs on preparing CCAs and UNDAFs, which contain guidance on the structure and content of UNDAFs and on the implementation of RBM at country levels including a matrix for operationalizing RBM Despite the progress made in implementing RBM within the United Nations system organizations, there is a lack of harmonization among the different RBM approaches across the United Nations system, thus negatively impacting its use at the country level, including in Africa. Various shortcomings and challenges with regard to the implementation of RBM at the country level have been identified in reviews conducted by the CEB, UNDG and the 62 CEB/2005/HLCM/R Resolution 60/257 endorsing paragraph 248 of the report of the fifty-fifth session of the Committee for Programme and Coordination. 64 See JIU/REP/2004/6, Box 1: RBM concept and definition. 37 27 United Nations Evaluation Group (UNEG). 65 Among the issues of concern are that: the UNDAF results are often not SMART 66 enough; different RBM terminologies and approaches are used; most of the RBM manuals developed by the United Nations system organizations do not distinguish between UNDAF outcomes and the outcomes of the respective organizations; the UNDAF results matrices and the related monitoring and evaluation plans are not always adequate, operational and sufficiently owned at all levels; timely, comprehensive and adequate information and reporting on the status of the implementation of the UNDAFs is not available; and the roles and responsibilities for monitoring and reporting on UNDAF results are not yet fully operational Some of these concerns were also shared by officials met during the missions undertaken by the Inspectors. Given these drawbacks and despite the progress being made in strengthening RBM within the respective United Nations system organizations, the Inspectors are of the opinion that there is a need to strengthen RBM at the country level with a view to achieve a system-wide harmonized RBM approach for the implementation of the UNDAFs in Africa. Thus, a common and harmonized implementation of RBM at the country level not limited to an individual organization but comprising the whole United Nations system would make it collectively responsible for the implementation of the UNDAF results and outcomes. In this regard, the relevant reviews of the CEB, UNDG and UNEG should be taken into account 68 as well as the series of JIU reports on RBM The implementation of the following recommendation is expected to strengthen the implementation of RBM at the country level with regard to the implementation of the UNDAFs in Africa. Recommendation 16 The General Assembly and the legislative bodies of the corresponding United Nations system organizations should reaffirm their commitment to results-based management (RBM) and request the executive heads of the United Nations system organizations to harmonize their RBM practices to achieve a common RBM approach at the country level for implementation of the UNDAFs in Africa. E. Enhancing aid predictability and funding 123. Adequate, predictable, timely and multi-year funding is a prerequisite for an effective, coordinated and coherent United Nations system at the country level. The High-level Panel on United Nations System-wide Coherence stated in this regard that: If the United Nations is to 65 See Results based management at country level: systemic issues that prevent good UNDAF results and the use of UNDAF results information, paper presented to the Working Group on Programming Policy, UNDG, 2 September 2008; UNEG, The Role of Evaluation in Results-Based Management (RBM), UNEG, 5 February SMART results are: Specific, Measurable, Achievable, Relevant, and Time-bound; see also UNDG, Common Country Assessment and United Nations Development Assistance Framework, Guidelines for UN Country Teams on preparing a CCA and UNDAF, United Nations, February See Results Based Management at country level: Systemic issues that prevent good UNDAF results and the use of UNDAF results information, paper presented to the Working Group on Programming Policy, UNDG, 2 September 2008; UNEG, The Role of Evaluation in Results-Based Management (RBM), UNEG, 5 February Ibid. 69 See para.117 above. 38 28 work more coherently and effectively, both at the country level and globally, significant changes are needed to the way donor funding is managed. Current United Nations funding patterns are highly fragmented, unpredictable and constrained by too much earmarking, which has encouraged duplication and inefficiency. This limits the United Nations and programme countries from making strategic decisions, and undermines the principles of multilateralism and country ownership. 70 These concerns, negatively affecting United Nations system support to Africa, were also widely shared by the officials of the United Nations system and its African development partners during the discussions and meetings held by the Inspectors In responding to these deficiencies and gaps, various efforts have been made to improve the predictability of funding for development activities within the United Nations system including the introduction of multi-year funding frameworks; the establishment of thematic funds for addressing specific cross-cutting issues; the adoption of a concept of negotiated core voluntary funding, better alignment of extrabudgetary resources with the priorities of the major programmes of the organization and the country concerned through sector strategic frameworks; and the creation of regular budget supplementary accounts allowing additional voluntary contributions to the regular budget. 71 Another innovative approach was the establishment of pooled funds which, for example, in the case of the Central Emergency Response Fund (CERF) 72 at the global level and the Common Humanitarian Funds (CHF) 73 and the Emergency Funds (ERF) 74 at the country level, have been reported as a more effective and needs-based funding mechanism for humanitarian emergency activities. The introduction of single budgetary frameworks in the Delivering as one pilot countries is also a possible way to jointly and coherently mobilize resources at country level and perhaps to secure part of the funding needs of priority programme activities in the One Programme/UNDAF for the United Nations organizations in the country The Inspectors believe that coherent, effective and coordinated United Nations system support to Africa at the country level is highly dependent on and requires adequate and predictable funding covering a multi-year period. They welcome the significant efforts made by many United Nations system organizations, funds and programmes to increase the level of core/regular budget funding through various, often innovative approaches. However, the Inspectors are of the view that the situation is still far from reaching optimum levels. For example, the General Assembly in resolution 62/208 urged donor countries and other countries in a position to do so to increase substantially their voluntary contributions to the core/regular budgets of the United Nations development system, in particular its funds programmes and specialized agencies, and to contribute on a multi-year basis, in a sustained and predictable manner In particular, due to the tight interdependence between the availability of adequate, predictable and multi-year funding on one hand and coherence and effectiveness on the other, as well as the fact that the first is a prerequisite for the latter, the issue of adequate, timely, predictable and multi-year funding requires renewed and continuous consideration by the United Nations system and its governing bodies. In that context, it should be recalled that the Paris Declaration on Aid Effectiveness of March 2005 by ministers of developed and 70 A/61/583, Report of the High-level Panel on United Nations System-wide Coherence in the areas of development, humanitarian assistance and the environment, summary. 71 See A/62/73-E/2007/52, paras See 73 See, e.g. the Sudan Common Humanitarian Fund at 74 See OCHA guidelines for ERFs, available for example at US/Default.aspx. 75 Paragraph 19. 39 29 developing countries also called for an increasing alignment of aid with the priorities, systems and procedures of beneficiary countries and for eliminating duplication and dispersion of effort. 76 This was reaffirmed in the Accra Agenda for Action (AAA), adopted at the Third High Level Forum on Aid Effectiveness in Accra on 4 September Finally, considering the current global economic crisis, the financial turmoil and the damaging impact on financing for development, renewed commitment, massive and coordinated efforts and innovative approaches for ensuring aid sustainability are urgently needed to prevent, as the Secretary-General put it recently, the onset of new catastrophes 77 triggered by growing poverty, political instability and social unrest in many developing countries. Against this background, the G-8 and G-20 recently took significant initiatives which were reflected in the measures adopted by the Bretton Woods institutions in support of Africa Therefore, in the view of the Inspectors, the General Assembly and the legislative bodies of other relevant United Nations system organizations should recommit themselves to the funding principles for improvement of aid quality and its impact on development in support of the AU and its NEPAD programme, and the corresponding needs and priorities of the beneficiary countries. They should support, as appropriate, the introduction of funding mechanisms and modalities aimed at enhancing the adequateness, timeliness, predictability and multi-year availability of funding for their programmes at the country level, in order to achieve increased effectiveness and coherence of these programmes In this context, reference is also made to the review undertaken by the JIU entitled Voluntary Contributions in United Nations System Organizations. Impact on Programme Delivery and Resource Mobilization Strategies (JIU/REP/2007/1) containing several recommendations, of which recommendations 1, 2 and 3 referred to the need to mobilize more voluntary contributions for core resources; the need to develop flexible funding modalities such as thematic funding and pooled funding; and the need to review the existing policies and procedures that guide interactions with donor countries to ensure that they are conducted in a systematic and open manner. The need for extrabudgetary contributions is more flexible, predictable, less conditioned, and better adapted to the development priorities of beneficiary countries. This was also reaffirmed by the JIU review entitled National Execution of Technical Cooperation Projects (JIU/REP/2008/4) In the view of the Inspectors it would be useful if consideration of this important issue by the United Nations system were to be accompanied by a comprehensive review by the CEB on resource mobilization, funding mechanisms and modalities for implementation of activities at the country level under the UNDAF frameworks in Africa. Taking stock of the work by the United Nations Conference on Trade and Development (UNCTAD) on external debt, official development assistance and aid effectiveness, foreign direct investment and resource mobilization and commodity dependence, 79 the review should draw upon the experiences of the United Nations system organizations in introducing new approaches and measures addressing funding predictability and multi-year availability of funds, as well as on the experiences and lessons learned from the Delivering as one pilot countries in this 76 The Paris Declaration on Aid Effectiveness was agreed at the High Level Forum held in Paris from 28 February to 2 March 2005 by developing and donor countries, AfDB, ADB, the European Bank for Reconstruction and Development, the Inter-American Development Bank, the Development Assistance Committee of the Organisation for Economic Co-operation and Development, the United Nations, and the World Bank. 77 Statement on 24 March 2009 in London ahead of the G-20 Summit, April See Recommendation UNCTAD also launched, in February 2007, a development account project to strengthen the capacity of African countries to identify and utilize non-debt-creating domestic and foreign resources for growth and poverty reduction within the framework of the MDGs. 40 30 respect. The review should also provide an update of the status of implementation of the Paris Declaration and the AAA. Finally, given the important role of the African private sector for sustained growth and accelerated development, its strategic involvement, in particular the advocacy of multinational enterprises in areas such as water, energy, transport, communication and other infrastructure development projects should be reflected in the review. In this respect, the coordinated partnership with the African and international financial institutions should be also taken into account The implementation of the following recommendation is expected to facilitate a move towards a more adequate, predictable, timely and multi-year funding of United Nations system programmes at the country level in support of Africa, taking into account the needs and priorities of the beneficiary countries. Recommendation 17 The Secretary-General, in his capacity as Chairman of the United Nations Chief Executives Board for Coordination (CEB), should initiate through the CEB a comprehensive review on resource mobilization, funding mechanisms and modalities within the United Nations system for ensuring the financial sustainability of the United Nations system support to Africa within the RCM and UNDAFs, including the strategic involvement of the African private sector, as well as coordinated partnership with the African and international financial institutions. 43 33 Annex II THE REGIONAL COORDINATION MECHANISM LIST OF PARTICIPATING ORGANIZATIONS BY CLUSTER Cluster Coordinator Sub Cluster Members INFRASTRUCTURE DEVELOPMENT WATER AND SANITATION, ENERGY TRANSPORT AND ICTS ECA AfDB, FAO, IAEA, IMO, ITU, ECA, UNCTAD, UNDP, UNEP, UNESCO, UNICEF, UN- HABITAT, UPU, WHO/WAC, WIPO AND WMO WATER ENERGY ICT TRANSPORT GOVERNANCE UNDP AfDB, DPA, DPKO, IMF, NEPAD, OCHA, OSAA, UNDESA, UNDP, ECA, UNFPA, UNHCR, UNICEF, UNOHCHR, WORLD BANK, AND WFP SOCIAL AND HUMAN DEVELOPMENT UNICEF FAO, IAEA, ILO, IOM, UNDP, ECA, UNESCO, UNICEF, UNIDO, UNFPA, WFP, WHO/WAC AND WIPO UNESCO ILO UNAIDS HUMAN RESOURCES EMPLOYMENT HIV/AIDS ENVIRONMENT, POPULATION AND URBANIZATION UN-HABITAT IMO, ECA, UNEP, UNESCO, UNFPA, UN- HABITAT, AND WMO AGRICULTURE, FOOD SECURITY & RURAL DEVELOPMENT FAO FAO, IAEA, UNCTAD, UNDP, UNESCO, UNICEF, UNIDO, UNHCR, WFP, IFAD, ECA, WIPO, WORLD BANK AND WTO SCIENCE AND TECHNOLOGY ADVOCACY AND COMMUNICATIONS UNESCO, ECA (VICE COORDINATOR) OSAA UNESCO, ECA, WIPO, UNIDO, FAO, IAEA, OSAA, UNEP, WORLD BANK, CGIAR, UNDP, UNCTAD, UNU/INTECH, AND WHO UNEP, UNON, UN-HABITAT, WORLD BANK, NEPAD, UNAIDS, UNHCR, UNESCO, ITU, UNDP, UNFPA, UNICEF, ECA, OSAA AND DPI PEACE AND SECURITY DPA DPA, UNHCR, ILO, UNDP, OHCHR, ECA, FAO, IOM, DPKO, WFP, UNAIDS, AND WHO DPKO UNHCR OHCHR PEACE AND SECURITY ARCHITECTURE OF THE AU POST-CONFLICT RECONSTRUCTION AND DEVELOPMENT HUMAN RIGHTS, JUSTICE, AND RECONCILIATION INDUSTRY, TRADE AND MARKET ACCESS UNIDO ECA, UNIDO, UNCTAD, ITC, ICF, WTO, WIPO, UNDP, UNESCO, IAEA, UNEP, FAO, ILO, UN- HABITAT, AfDB, AND WORLD BANK Source: ECA, booklet Delivering as One for Africa, The Regional Consultation Mechanism (RCM) of United Nations Agencies and Organizations, page 10.